Entrance Access Solutions LTD offer a wide range of bespoke service and maintenance packages to suit your business and premises needs, from our pay as you go service to our fully comprehensive package all offering great value for money. We can provide a maintenance package completely tailored to your needs, from a small independent business to large national retailer. Maintenance to your automatic door products is vital, ensuring that the products are safe and comply with the lastest BS7036 and EN16005 safety standards. Also guaranteeing that you achieve the maximum life span from the equipment with no unnecessary breakdowns. 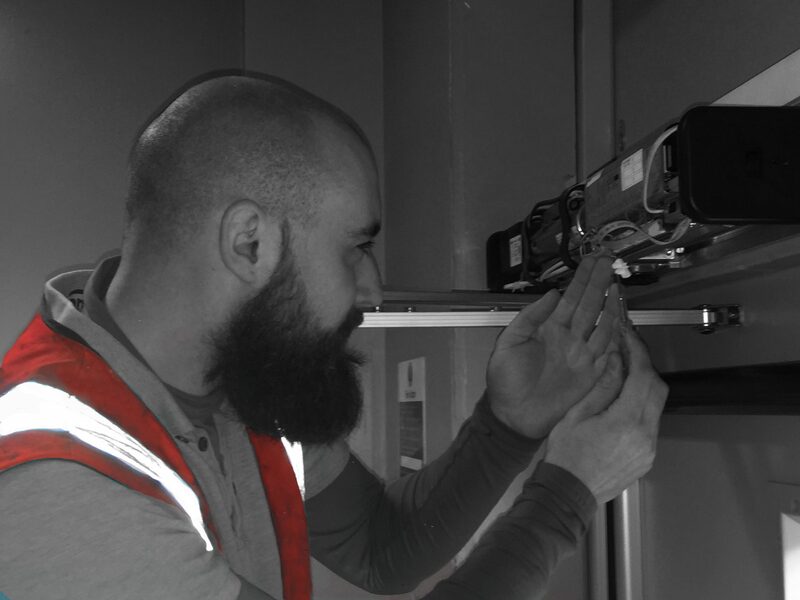 We can achieve this with our annual or 6 monthly pre planned maintenance, where we carry out stringent health and safety checks on all aspects of the door operator and activation and safety devices. Any recommendations will be reported back to you to help you comply with regulation. We will also replace any defective consumable parts such as floor guides or bottom pivots and carry out adjustments. All of this is available with our comprehensive package. This allows us to take on the maintenance contract where there is a wide veriety of automatic operators throughout the estate. We offer a pre-planned maintenance service that covers you for a visit from EAS twice a year. Once every six months, we check over all automatic door, manual doors and make sure that everything is running properly with your door systems. We can make minor adjustments and quickly replace consumable parts. We will check and replace things like floor guides, carriage wheels and bottom pivots. Entrance Access Solutions will also make recommendations in order to prolong the lifespan of your doors and automatic operators. Who are maintenance contracts for? We recommend that anybody who has Automatic Doors should have a maintenance contract in place. Entrance Access Solutions has seen this type of service become ever more popular. Automatic Doors can be a large investment for any business and if they are not maintained properly then you will not get the full value for the product nor the full lifespan of the product. Why do I need a maintenance contract? If proper maintenance and checks are not carried out on your doors to ensure they are BSEN compliant, then you as the business owner may become liable for any incident or accident that occurs. Whereas if your doors are constantly and adequately maintained, then you can be assured that the products are safe and working to the correct standard. Entrance Access Solutions can actually supply documentation every six months to prove that your door is compliant with BSEN16005. How does a maintenance contract work? The maintenance contract is priced on a per visit and per asset basis. We consider how many automatic doors and manual doors you have on your site. That amount is paid twice a year. How do you carry out your maintenance? Entrance Access Solutions follows a structured process in which it looks at all of the consumable parts. As an example, if it is a sliding door then we would inspect the carriage wheels, or if it is a swing door we will carefully examine the pivots and the gear box. EAS will cover absolutely every element of the door, every safety device, key switch, sensor or push button. Any device associated with your doors functionality will be carefully examined, tested and signed-off. What parts are covered by the maintenance contract? Consumable parts can be part of the maintenance contract depending on your business needs. On the other hand, parts that do need replacing can be part of a further quote. This could include things like sensors or push buttons. In the first instance Entrance Access solutions will supply you with a written report advising you on what work needs carried out in order to prolong the life of your system. This would include a quotation for any parts required for your manual or automatic doors. What should I ask for in a maintenance contract? It is important to make sure that the company that is doing your maintenance visits has all of the correct accreditations in place, as well as any appropriate insurance that may be required. Be sure that you get testimonials and examples of their previous work. We cannot stress how important it is to ensure you have a reputable door maintenance supplier in place, door safety is at the forefront of Entrance Access Solutions mind. If you would like a FREE no-obligation competitive quotation, specifically tailored to your requirements, please get in touch to find out what Entrance Access Solutions can do for you.